I was skeptical. Every fan that pays much attention to U.S. soccer learns to live with a certain level of anxiety. It doesn’t matter if we’re playing Brazil in a final or the island dot called Barbados in a qualifier – for every match in recent memory, you’re just never sure what kind of American team is going to show up. Sometimes they’re great, other times they look like a junior high team trying to keep up with the varsity boys in practice. Our new head coach, the inestimably cool Jurgen Klinsmann, has been held up as the needed jolt for a U.S. that often looks adequately talented, but sadly lackadaisical. He’s done decently so far, but fans have been pressed to see much of a visible difference between this team and Bob Bradley’s 2010 World Cup squad. Last Tuesday, September 11th, finally saw that difference. For the first time in my life, I actually had a blast watching U.S. soccer. The men were, well, quite frankly – playing like men. Gone was the tentativeness that marked us so often in the past. The world has often told the U.S. that we can have every sport – except soccer. And we’ve believed them. This week, we played like we belonged with the elite. Landon Donovan, the supposed premier part of the U.S. squad, did not play. Clint Dempsey – recently in the headlines, and in my writing – played from start to stop, but lacked his usual touch. Too many weeks spent out of practice negotiating his trade in the English Premier League left the Texan forward looking a little rusty. But our other men picked up the slack…and then some. Steve Cherundolo, the old but ridiculously fit veteran, took control of the pace of the game – and he set it fast. From the first minute, the U.S. played with a sense of controlled urgency; using Jamaica’s sit-back defensive attitude to completely dominate possession – thus allowing them to pick their shots, and take many of them at that. 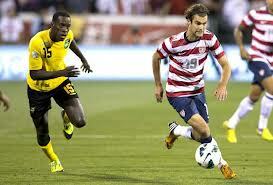 Graham Zusi, a newer addition to the squad making his first start of the year, performed like a seasoned champion. The U.S. knocked on the woodwork the entire first half, pounding away with shots on goal that required the Jamaican keeper to pull out absolutely every tool in his kit. The goal post proved Jamaica’s friend in the first half as the U.S. had three shots deflected out by inches after hitting the post. Graham Zusi was one of the men denied by millimeters in the first half as, midway through, he launched a long-range curler that screamed past the goalie, and just deflected off the top cross bar – leaving the packed Columbus stadium gasping. The one, only, and deciding goal came early in the second half from the boot of the impressive Hercules Gomez, curling one in from a free-kick that grazed the Jamaican keeper’s fingers and found it’s way into the back of the net. It was a goal that was well due and well-deserved, and when the U.S. closed the game with a 1-0 win, not a soul felt that it should have been any less. The change I saw in the U.S. team on Tuesday was a big one. They didn’t just get good strikes or have a few good looks; it was as if they completely changed their style of play. And it’s about time if you ask me. Klinsmann no doubt preached pace and a must-win attitude before the game, but he also did a great job of picking out the right bodies for the job. Our young players kept up energy, while the older guys smoothed over touches and looked for breakaways and runners. The U.S. was able to possess the ball with a level of comfort I’ve never seen them play with before. One-touchers, quick passes, close shots on goal, creativity – the American’s showed it all. Watching the U.S. on Tuesday was reminiscent of watching the likes of Barcelona or Real Madrid in the Spanish league. Quickness, pace, and smooth touches. The American’s played the “beautiful game” on Tuesday in a way that did homage to the adjective – a hopeful sign of things to come. This entry was posted in Soccer and tagged Barbados, Barcelona, Ben Liebing, Bob Bradley, Brazil, Clint Dempsey, English Premier League, Graham Zusi, Hercules Gomez, Ian Darke, Jamaica, Jurgen Klinsmann, Landon Donovan, Real Madrid, Steve Cherundolo, World Cup. Bookmark the permalink.